This page describes a tool I wrote many years ago (in the case of AudioPaint, it was created in 2002). You will probably need to fiddle around to make it work on a recent machine (hunt down old MFC libraries etc…) and I don’t give any guarantee of any sort about its state or usefulness. To make it short: you are on your own! AudioPaint generates sounds from pictures. The program reads JPEG, GIF, PNG and BMP files and translates each pixel color and position into frequency, amplitude and pan information. 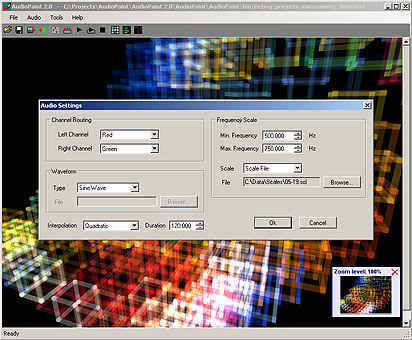 AudioPaint can therefore be considered as a massive additive synthesizer. A picture is actually processed as a big frequency / time grid. Each line of the picture is an oscillator, and the taller the picture is, the higher the frequency resolution is. While the vertical position of a pixel determines its frequency, its horizontal position corresponds to its time offset. By default, the color of a pixel is used to determine its pan, the red and green components controlling the amplitude of the left and right channels respectively (the brighter the color, the louder the sound), and the blue component is not used. The action of each component can be modified in the Routing section of the Audio Settings window. Starting with version 2.0, AudioPaint can also convert the color components into HSB values, and use hue, saturation and brightness instead of red, green and blue. Depending of the picture, several hundreds (or even thousands) of oscillators can be generated simultaneously. Due to the large amount of data to process, AudioPaint is not real-time. Once you chose your picture and the parameters, you generate a sound. Then you can save it as a .WAV file for further processing in a sound editor such as Sound Forge / Wavelab etc…. or to import it as an audio track in a sequencer (Sonar, Acid etc…). Of course the sounds generated will vary depending on the type of picture used. I tested AudioPaint with pictures taken by the Hubble Space Telescope and available at the Hubble Heritage Gallery of Images. The results are complex and fascinating futuristic soundscapes, especially with long durations. Generative graphics, which usually exhibits a lot of colors while having a geometric composition, work especially well. But you can really try any type of picture: maps from Google are also a good starting point for your sonic exploration, as well as paintings of Picasso, Monet and other great artists. Starting with AudioPaint 2.0, it is even possible to acquire random (but suitable) pictures from the Internet directly from the program. And of course, don’t hesitate to create pictures especially for AudioPaint, in PhotoShop or a similar graphic package. By playing with geometrical shapes and colors, you can create very interesting sounds. Here are a few sounds generated with AudioPaint. There has been no post-processing and no effects added. Instant Noodles : generative curves with a 5-tone scale for instant Chinese music. Crystal : a 3D mathematical function using a 7-tone scale. NanoProbe : geometric construct with linear frequency scale. Mercury Rain : generative clouds of points for granular synthesis. Aurorae : ethereal drone made from curves contained in a narrow frequency band. Cosmic Ray : generated from the picture of a constellation. Magical : interlaced curves playing on a magical scale. Ghosts from Space : the mysterious sound of Supernova Remnant Cassiopeia A.
Martian Soundscape : a 3-minute soundscape generated from a picture of Mars. Click here to download AudioPaint. Unzip the file and run the installer. Make sure you read the documentation (the AudioPaint.pdf file). If you can’t run this program, please update Microsoft .Net Framework to version 2.0 or higher. Thank you very much for this unique experimental synth! It’s always good to see the software used in actual projects / tracks. Sounds great too! i’d like to set the waveform and the scale. how to create a file .slc and file for the waveform ? For the waveform, you can use a regular wave file (there are some limits though if I remember correctly). The documentation should be installed with the software. Look in the install folder. Thank you for the kind words, always love to see what people are doing with AudioPaint! This would not be out of place in an old Star Trek episode! Audiopaint = WOW! Just started experimenting with this and it’s really nice. Wondering what is the licence status? I mean if I have my own software and want to include Audiopaint also (AS IS, with docs and everything…credits of course also) can I do it? any limitations ? And as a .NET developer myself, GREAT WORK ! Most fantastic piece of software I have came across when dealing with audio effects and conversions into audio of some of my very own photography. I find natures patterns create some of the best sounds to work with. I do have trouble trying to get some images to encode to audio though (normally really large images in either oscillators or length). I have a dual core system yet it only runs on one core. One task I would like to see done to it as a final “tweak” to something already amazing is to make it run on modern x64 systems on multiple CPU cores to increase the encoding speeds for really large files (1000’s of oscillators like 10 megapixel images and more). Hi Rohit, this is an “artistic” interpretation of an image as a sound in which information is lost so it is not suitable for transmission. Just confirming that Audio Paint runs without any issue on Windows 10. Hi I’d really love to use your software, theres only one problem… I can’t use the installer. I don’t know if it’s because the program was made in 2011 or if I’m doing something wrong. It would be very very much appreciated if someone could help me with this. thank you.